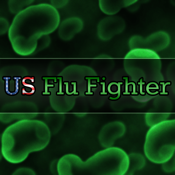 US Flu Fighter is the best app for iPhone that helps you stay on top of the threat from flu. With US Flu Fighter, you can see the current flu activity by state across America, view the current activity for each individual state, as well as see graphs plotting the history of each state's flu activity. Share a state's flu activity level via Facebook or Twitter with the touch of a button. This app also provides access to the complete catalog of CDC flu updates and podcasts, meaning all the most important info relating to flu is always in your pocket. US Flu Fighter makes it easy to share this information with the people you care about on Facebook and Twitter. The app also provides you with a handy tip-of-the-day to help you remember important ways to keep yourself safe from flu.